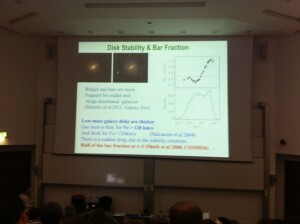 I think I won’t get in too much trouble if I say that in my opinion the event of summer 2011 for extragalactic astronomers was a massive international conference which took place in Durham, July 18th-22nd Galaxy Formation. You’ll be happy to know that Galaxy Zoo scientists were represented, with myself, Kevin, Ramin Skibba (who wrote one of the first Galaxy Zoo papers back in 2009), Vardha Bennert (who has done some HST followup for us, she’s profiled in the “She’s an Astronomer” series from 2009) and Boris Haussleur (see his blog posts about Hubble Zoo) all present. 400 Extragalactic Astronomers in Durham. That's me circled in orange, Ramin in pink and Boris in blue. Kevin and Vardha might be there somewhere but I've yet to spot them! 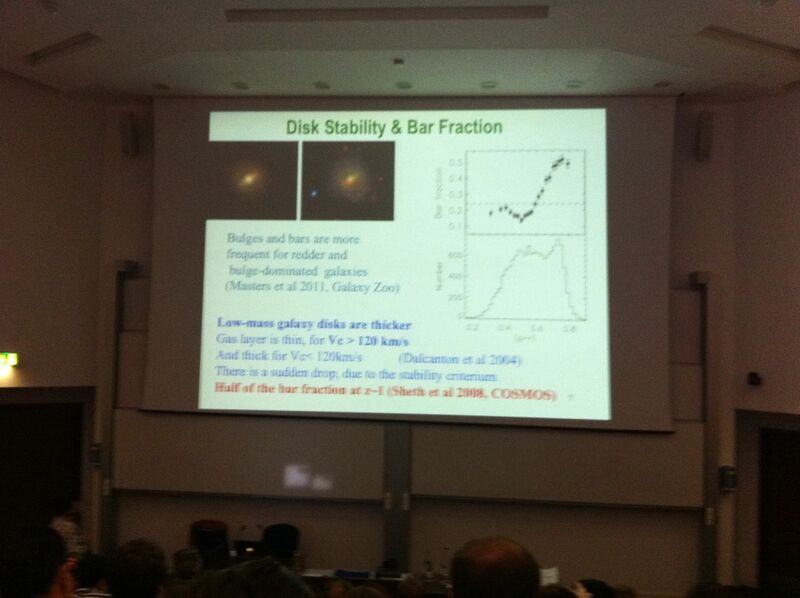 The moment of the conference for me was the first mention of Galaxy Zoo in the plenary talks – my work on the Galaxy Zoo 2 bars (see many blog posts!) was mentioned in a talk on the influence of internal evolution on galaxies (something we call “secular evolution” which bascially means the slow transformation of galaxies by material being moved around by the bars and/or spirals) which was given by Francoise Combes. I got so excited I took a picture of her slide, which you can also see in her talk pdf. And here’s the slide so you can actually read it. 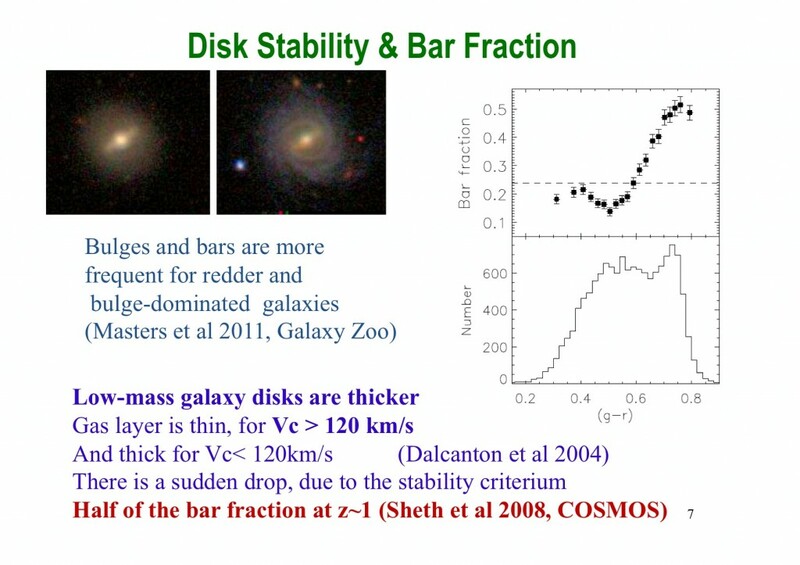 The red spirals also got a mention in a talk on gas in galaxies (by Luca Cortese – pdf unfortunately not uploaded at time of writing) where it was shown that at least half of them have very low NUV (near ultra-violet) emission for spiral galaxies. This is expected if as we think they are truly passive spirals with very little current star formation (which created NUV light). Many of the slides for the talks, as well as the posters are available online (including mine, which for once wasn’t about my Galaxy Zoo work, but work with the new SDSS survey which is imaging 1.5 million galaxies at intermediate redshifts – unfortunately as fuzzy blobs, so no new objects for the Zoo from them!). There is also a plan to make video of the talks available. I’ll post an update about that when it happens. Boris and Ramin had posters – also like me on their non-Galaxy Zoo work (Boris: Measuring the physical properties of galaxy components in modern multi-wavelength surveys, Ramin: Are Brightest Halo Galaxies Central Galaxies?). It was a great conference and I had a wonderful time in Durham. That’s a big old group! Do you know when Luca Cortese’s talk will be uploaded? I’m very interested to get more details on the passive red spirals. It was an impressively large collection of astronomers! I was surprised to find talks not already there, since they were supposed to have been uploaded already, but hopefully Luca will get around to putting his up soon.